Recently, there has been a lot of discussion about the term Industrie 4.0. Many companies and institutions are dealing with its definition and precise interpretation. As a result, there are many different opinions about what is exactly meant by Industrie 4.0, which are largely incompatible to each other. 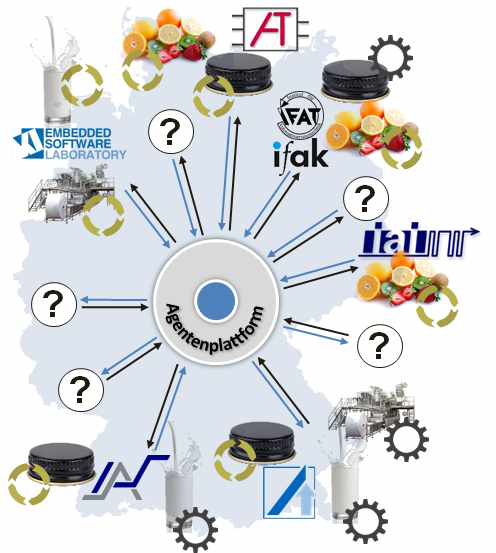 Our demonstrator is supposed to illustrate the possibilities that we see enabled by Industrie 4.0 for automation technology and present a suitable implementation. From this implementation, various potentials and solutions can be derived which will be presented in a practical way. Through the demonstrator, the coupling and interconnection of physically distributed production facilities are to be displayed exemplarily. This interconnection is to be realized in an automatic, dynamic and scalable manner. In addition, scenarios are to be developed, which can be presented coherently and quickly to other parties in a few sentences. These scenarios are intended to convincingly give an idea of Industrie 4.0 and prove the feasibility of such projects. All listed scenarios are executed fully automatically, without direct manual intervention during the operation. As a basis, the fully automatic production is to be realized with physically distributed production facilities. For the realization of the demonstrator's information flows, their representation is crucial, while a transport of real goods, e.g. bottles between the systems or the production of real yogurt, is ultimately not necessary. The creation of this distributed system, and thus the coupling of the Information Technology systems involved, is particularly important for the successful realization of the demonstrator. For this, a homogenous communication standard between the systems is necessary to allow data to be exchanged and the function of the entire system to be made possible. Subsequently, to enable data exchange, a unified data model is necessary, including technologies such as data containers and software agents. With this flexible and standardized interface, the demonstrator is then easily extendable towards other scenarios, opening up vast possibilities for further steps. In order to participate in the demonstrator network, it is only necessary to download the provided starter kit, which is available on this website and may be adapted to your own desires and needs. Downloading the starter kit, available for both Windows and Linux systems, is enabled after a simple registration process.